The Prince of Wales made a keynote speech at the opening session of COP21 today as the global climate change conference began in Paris. His Royal Highness told leaders and negotiators their actions over the next two weeks would determine the fate of present and future generations. Over the next fortnight negotiators from 195 countries will attempt to reach a deal that will put the world on a path to prevent temperatures rising by more than 2C (3.6F) above pre-industrial levels and avoid dangerous climate change. David Nussbaum, Chief Executive of WWF, said: "As [His Royal Highness] says, we have the knowledge, the tools and the money to put us on the right low carbon path for 2030. Later, The Prince of Wales accepted the Prix François Rabelais award in honour of his longstanding commitment to organic farming and protection of the environment. His Royal Highness was at the Institut de France in Paris to receive the award, which was established by the European Foundation for Culinary Heritage. 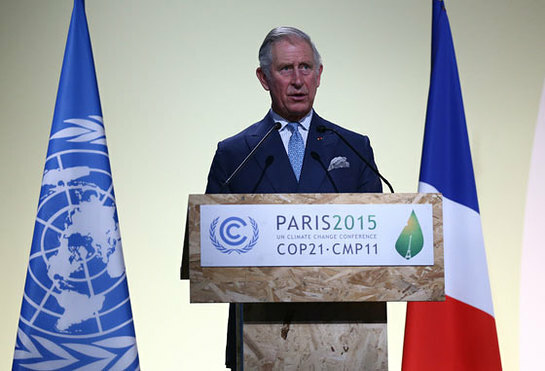 During the acceptance speech, The Prince of Wales highlighted the importance of healthy soils and backed an initiative by the French government, as part of the international climate talks, to boost the storage of carbon in the ground. Following the speech, His Royal Highness toured the Bibliotheque Mazarine, the oldest public library in France.